2012 was a great year Richmond! 2012. The best year yet. Thank you Richmond. For everything. You make this event unbelievably awesome every year. We don’t have a specific count, but I’m pretty sure we went well over 600, maybe 700, zombies on the streets last Saturday. We were also able to break the $1000 mark in donations this year. I never thought we’d be able to do something like that, but there it is. You guys rock the house like that. 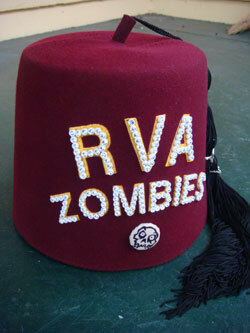 We’ve already got our sights set on next year for the 9th Annual Richmond Zombie Walk on Saturday, October 26, 2013. Go ahead and save that date now. Nobody will judge you. We promise. We were able to award a handful of special prizes to some exceptional zombie costumes and had our event posters autographed by our grotesquely wonderful illustrator, Abigail Larson. By the way, stay tuned for more information on event poster availability. We’ll be reprinting very soon. Special thanks to Abigail Larson for creating our event poster for the past 3 years. We hope you can do it every year. Thanks to our make up artists, Tony, Jennifer, Liam and Nico, that help with the Make up and Costume Workshop. Also a shout out to Scott and the Richmond Fencing Club for hosting, RVA Magazine, Zombie Victory Gardens, our sponsor Costume SuperCenter, our contest winners and you, my stinking undead walkers. Bloody kisses all around. See you next year.